I was reading Peter Parker: The Spectacular Spider-Man #310 on a train in Portland, Oregon. I’d been carrying the issue around, folded in half in my coat pocket for a few days, and the blue line to Beaverton was my chance to read it. It’s a really good issue, written and drawn by Chip Zdarsky. Get it. When we got off the train, I heard one of my friends say, “Don’t tell him. He’ll just be depressed.” But I made them tell me. Stan Lee was dead. I carried Spectacular Spider-Man #310 around with me for the next few days. It came with me into the city, out to Cannon Beach. It just felt right. I know it wasn’t something Stan wrote, but it was the closest thing at hand. Even though it wasn’t Stan’s work, Zdarsky gets it, and if there are comics shops in the afterlife, which there goddamn better be, I think Stan would be pleased. I wanted to write something that celebrated Stan. Those early issues of The Amazing Spider-Man are just so much fun. It would be impossible for me to overstate what The X-Men meant to me as a kid. Fantastic Four, Daredevil, Thor, Hulk, Iron Man, Doctor Strange, the revival of Captain America—movies, books, and the whole world would be a less interesting place without all of Stan’s work. What do you say about a writer who inspired the entire world? How do you speak about his impact? The answer is you don’t. You let him do the talking. 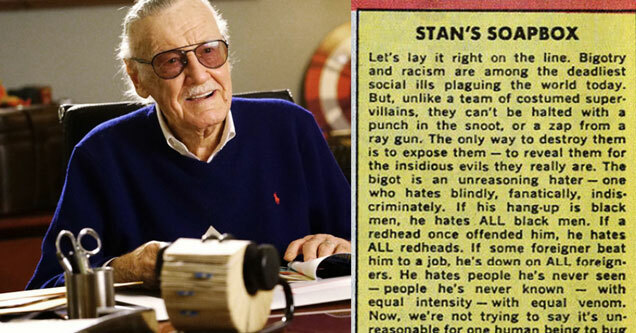 I’ve collected some of the best quotes from Stan’s Soapbox, a column that ran at the end of Marvel comics from 1967 to 1980, totaling 144 columns. Because while Stan was at his funniest, cleverest, and his best in the pages of Marvel comics, he brought readers into the world of Marvel through his soapbox. He was an ambassador for comics. He spoke directly to readers as if they were his friends. And that’s how he should be remembered. That purpose is, plain and simple — to entertain you! We think we’ve found the best formula of all — we merely create the type of fanciful yarns we ourselves like to enjoy — and if we like ‘em, you oughtta like ‘em too; after all, you’re our kinda people! Now then, in the process of providing off-beat entertainment, if we can also do our bit to advance the cause of intellectualism, humanitarianism, and mutual understanding… and to toss a little swingin’ satire at you in the process… that won’t break our collective heart one tiny bit! The mail hasn’t stopped pouring in, asking for our comments about the ever-continuing Marvel-Brand Echh rivalry! It seems that some of our less-than-redoubtable rivals are still taking pot-shots at us on the pages of their mags, and our loyal legion of letter-writers has been demanding to know what action we’re gonna take. Well, we’re sorry to disappoint the hawks among you, but we really don’t feel any action is warranted. Actually, they’re not competition! You see, they obviously aim for a totally different type of reader than we do. We don’t cater to any special age group, but we do cater to a special intellectual level. Our rollickin’ readers, no matter what their ages, have proven to be bright, imaginative, informal, and sophisticated! So we don’t mind when some of our roguish rivals claim to outsell us. (Although they never bother to mention that they PUBLISH more mags than we!) After all, everyone knows there’s less of our type of people than theirs! So, let them continue catering to the bubblegum brigade — and more power to ‘em. The public needs SOME sort of pabulum till it’s grown up to Marvel! ‘Nuff said? Over the years we’ve received a zillion letters asking for the Bullpen’s opinion about such diverse subjects as Viet Nam, civil rights, the war on poverty, and the upcoming election. We’re fantasmagorically flattered that our opinion would matter to you, but here’s the hang-up: there isn’t any unanimous Bullpen opinion about anything, except possibly mother love and apple pie! Take the election, for example. Some of us are staunch Democrats, and others dyed-in-the-wool Republicans. As for Yours Truly and a few others, we prefer to judge the person, rather than the party line. That’s why we seek to avoid editorializing about controversial issues — not because we haven’t got opinions, but rather because we share the same diversity of opinions as Americans everywhere. But we’d like to go on record about one vital issue — we believe that man has a divine destiny, and an awesome responsibility — the responsibility of treating those who share this wondrous world of ours with respect — judging each fellow human on his own merit, regardless of race, creed, or color. That we agree on — and we’ll never rest until it becomes a fact, rather than just a cherished dream! Stan was a constant advocate for comics’ place in the arts. It’s hard to imagine now, but there was a time when comics were not considered a legitimate form of art or communication. When he attended parties, Stan himself would often lie about what he did for a living! 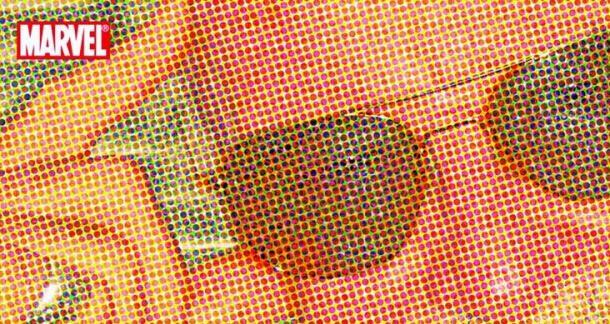 Comic books are a medium of communication — just as television and motion pictures are. All three employ words and pictures, and all must be judged on their individual merits. A story is a story, whether presented between the two covers, or on a screen. If the words have dramatic impact, if the pictures are visually appealing, if the theme is emotionally relevant, then certainly it is worthy of a reader’s attention. However, if the quality is lacking, then it rates little consideration. Isn’t this equally true of a TV program, a Broadway show, a motion picture, or any other form of Entertainment? All we at Marvel ask is that our product be judged on the basis of quality — a quality which we sincerely believe is equal to that found in any other comparable media. One of the things we try to demonstrate in our yarns is that nobody is all good, or all bad. Even a shoddy super-villain can have a redeeming trait, just as any howlin’ hero might have his nutty hang-ups. One of the greatest barriers to real peace and justice in this troubled world is the feeling that everyone on the other side of the ideological fence is a “bad guy”. We don’t know if you’re a far-out radical, or Mr. Establishment himself — if you’re a black militant or a white liberal — if you’re a pantin’ protest marcher or a jolly John Bircher — but, whatever you are, don’t get bogged down by kindergarten labels! It’s time we learned how fruitless it is to think in terms of us and them — of black and white. Maybe, just maybe, the other side isn’t all bad. Maybe your own point of view isn’t the only one that’s divinely inspired. Maybe we’ll never find true understanding until we listen to the other guy; and until we realize that we can never march across the Rainbow Bridge to true Nirvana — unless we do it side-by-side! Every time one of our sagacious superheroes guest-stars in another mag we get bombarded with the same type of complaints from Marveldon Assembled! “How can Thor be fighting litterbugs with Nick Fury when he’s in outer space with Winken, Blinken, and Nod in his own mag?" Or “How can Captain America be trapped by Aunt May in Spidey’s mag when he’s running a school for teen-age dropouts in his own swingin’ stanza?” So, we have two choices. Either we stop crossover guest-starring, or we ask you to permit us a little literary license. If the doings of one of our repertory players in his own mag doesn’t seem to jibe with his cameo appearance in some other mag during the same month, let’s just say that one story took place a few days before, or after, the other, huh? First, the artist and the writer have a story conference, because unlike other comic-mag publishers, Marvel believes the artist contributes as much to the story as the writer does. Then, once the plot details have been worked out, the artist goes off by his lonesome and draws the strip in pencil, drawing it any way he pleases, since the script hasn’t been written. (So far as we know, Marvel is the only company to use this free-and-easy, highly creative method. —Free plug!) Next, the penciled drawings are given to the writer, who creates the dialogue balloons, captions, and any other copy needed. After that, a letterer prints all the copy in the correct places (we hope), using a lettering pen dipped in jet black India ink. Finally, the pages go to the inker (embellisher) (or delineator — depending upon how fancy you are), who draws over the penciled sketches with a brush and/or pen, also using permanent black ink. Now that the pages are drawn and lettered, we make copies of them and one of our swingin’ staff of colorists paints these copies so that they can be used as color guides by the engraver when he receives the mag. After the engraver makes the engravings, they’re sent to the printer and another Marvel masterwork is lovingly brought to life. Steve Ditko also passed in 2018. I’d just seen some of his original Amazing Fantasy 15 artwork at a museum in Seattle, and it was incredible. We might’ve had Spider-Man without Steve Ditko, but he wouldn’t have been nearly as Sensational, Spectacular, or Amazing. It seems to me that a story without a message, however subliminal, is like a man without a soul...None of us lives in a vacuum — none of us is untouched by the everyday events about us — events which shape our stories just as they shape our lives. Sure our tales can be called escapist — but just because something’s for fun doesn’t mean we have to blanket our brains while we read it! ...As time went by...we began to touch upon real issues, real problems that confront this woebegone world of ours. Now, here’s the hairy part. The more relevant the stories became, the more flak we took from every spectrum of opinion. The radicals claim we’re too archaic! The conservatives claim we’re too liberal! The doves call us hawks, and the hard-hats call us peaceniks! The Pollyannas say we’re harbingers of doom, while the drop-outs and cop-outs say tell us we’re living in a fool’s paradise. No matter what we write or draw, half of you disagree — and just between us, that’s the way it oughtta be!...If we can make you think — if we can anger you, arouse you, stimulate or provoke you, then we’ve served our purpose. The short version, every comic should be provocative to someone. If it’s not, what is it really saying? It took him a couple years to get around to it, but Stan finally answers a question he often received: What is a bigot? From where I sit, bigotry is one of the many stains upon the human escutcheon which must be eradicated before we can truthfully call ourselves civilized. It comes in many forms and shapes, but it’s most easily recognized in the forms of cruel and mindless generalizations: such as when you hear some yo-yo say “All Italians are like this”, or “All Germans are like that”, or “All women are so-and-so”, or “All blacks, or Catholics, or Jews, or redheads, or whatever are like this”! Well, they may not be aware of it, but the turkeys that talk that way — and it’s always done in a disparaging, put-down manner, of course — are bigots. Plain and simple! Anyone with an I.Q. slightly above a cretin’s has to know that all of any type of humans are never always the same. There are good people and bad people, and all categories in between — and you’ll find ‘em amongst all races, all religions, all sizes, shapes, and sexes. You wanna dislike someone? Be my guest. It’s a free country. But do it because he or she has personally given you a reason to feel that way, not because of skin color, or religion, or foreign ancestry, or any other moronic, mixed-up mindless motive! Because, if you justify your hatred by smearing everyone in any given group with the same brush, you’re a bigot, Charlie! I guess what I’m trying to say is, sure we want Marvel to be your favorite comicbooks, and sure we’ll knock ourselves out to produce the best stories and artwork in the field. But we don’t wanna succeed at anyone else’s expense. We don’t want you to feel you have to knock the other guy in order to be loyal to us. The better our competition is, the more it’ll keep us on our toes — and the more you’ll profit by it! As Stan himself would put it, 'Nuff said.